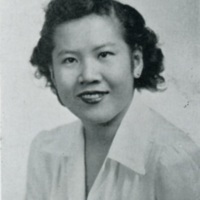 Senior portrait of Ada Chang, Class of 47, from the 1947 Ruby (the Ursinus Yearbook). This page from the 2002 Ruby (Ursinus Yearbook) talks about how the students on campus responded to 9/11 and what they did to help those in need. 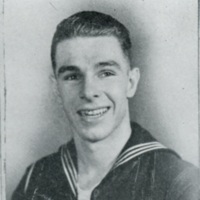 Portrait of Richard Schellhase, Class of 45 and member of the Ursinus V-12 Unit, from the 1945 Ruby (the Ursinus Yearbook). 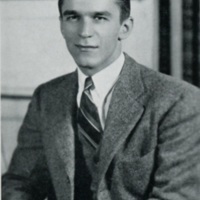 Senior portrait of Denton Herber, Class of 43, from the 1943 Ruby (the Ursinus Yearbook). 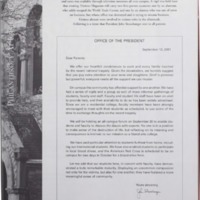 Former Ursinus President John Strassburger wrote to the parents of students about the then recent tragedy. 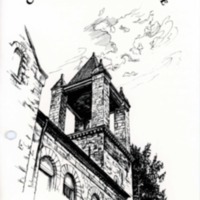 A couple of articles from the Ursinus Alumni Magazine. 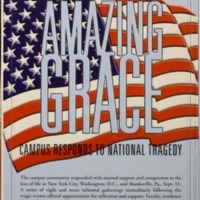 Articles include "Amazing Grace: Campus Response to National Tragedy", "Sept. 11, 2001: From Inside the World Trade Center", and "Business, not as Usual". 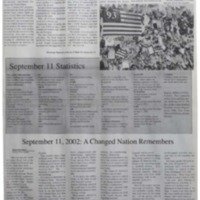 The front page of the campus newspaper, The Grizzly, a year and a day after 9/11. Articles include "America. No Longer the Beautiful", "September 11 Statistics", and "September 11, 2002: A Changed Nation Remembers". 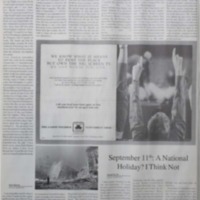 The fourth page of the campus newspaper, The Grizzly, a year and a day after 9/11. Articles include "Remembering September 11th: Student Essays" and "September 11th: A National Holiday? I Think Not". 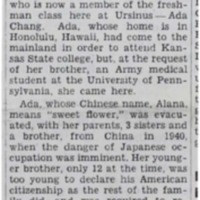 Ada Chang, a student at Ursinus, witnessed the attack on Pearl Harbor and recounts her story in the Weekly. Program for the dedication ceremony of the reliefs "Promise" and "Anthem".